This is intended to be a real quickie for the simple reason that so many of us have been waiting to get a look at it and maybe decide whether or not to buy it after all. The last two posts I see discussing this topic include this and this. Much better than I thought! Especially after reading the above two postings where almost all of us were disappointed with previously sought after gems. I immediately found it wetter than the other Edelstein gems, much wetter than the 4001s, also darker and more saturated than I was expecting. Swabs (single, double and triple), a Crest BB, a Pelikano M, and a Rubinato feather dipstick XF, in that order. This is all on Avery Zweckform 100 g/m2 paper. 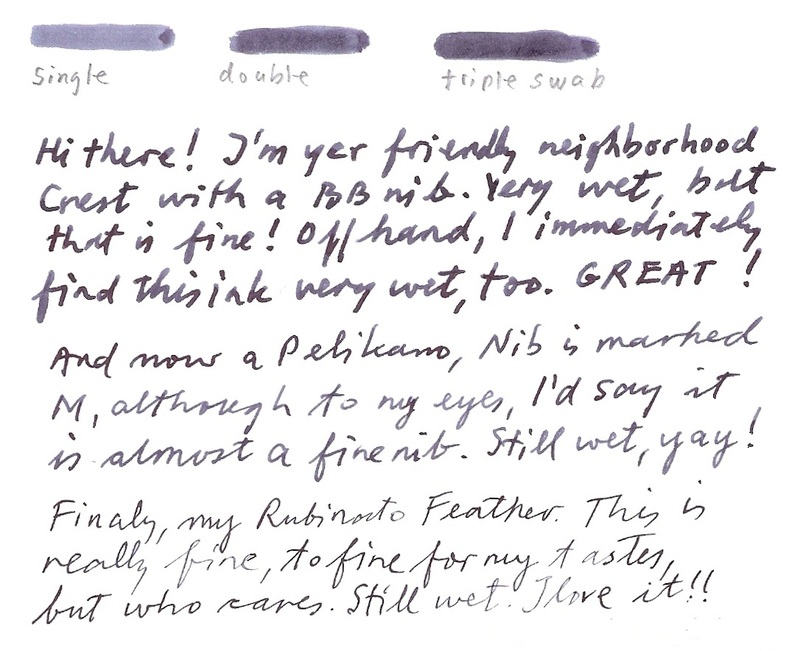 ■ Flow: Very good, wettest Pelikan ink I know of. ■ Saturation: High. Higher than most of the other Edelstein inks. ■ Shading: Not bad. With a flex, it'd be better (I think). ■ Waterproofness: No more than that of Pelikan's 4001 Blue-Black. ■ Drying time: 10-12 s, with my Pelikano M nib on this paper. The order of significance here is -- to start off with -- irrelevant but Pelikan's 4001 blue-black and PR's Tanzanite are obvious candidates. Then, I couldn't help thinking of MB's blue-black (I used the current Midnight Black here) and Sailor's Jentle blue-black which are the "best" blue-blacks I have, as mentioned earlier somewhere else today. C'mon, I know there are dozens of others but I wanted to start off small today.The famous Parker's and Waterman's blue-blacks don't have a chance (for me) because I still find them too much of a green-grey. Here's a shot which appears a bit too bright on my monitor. But just a bit. All with single-double-triple swabs, a Crest BB, and all on the same paper as above. ■ Similar colour to that of the 4001, a hint darker (blacker) together with a half a hint of red. ■ By no means as violet or purple as PR's Tanzanite, but that was no shock to me. ■ Not as black as MB's or Sailor's but at the same time more saturated. ■ Box and bottle are beautiful but the bottle isn't all that practical to get out the last few drops, and it's also hard to unpack out of the box. ■ Capping is a good as MB's new shoes, but only the capping. ■ The envisaged disappointments of previous gems here might possibly turn one off from trying out this one, too, and …. ■ As if that weren't enough, their prices are too high. One ml of these costs exactly twice as much as the older 4001 inks. ■ On the box's bottom and backside, I read "EXTRA SOFT INK". That may well be the right way to put it, at least for the other Edelstein offers, but I'm not sure that that would apply to this ink. ■ All in all IMO, this is still a more than a "good" ink. At least "better" than a lot of the other Edelstein things. If you have been disappointed up to now by those, then do get this Edelstein. Looks Great! I think I'll have a go! I'll pawn a couple of bottles of Twisted Spire and have a go. On my monitor, this looks a bit like Rohrer & Klingner Scabiosa. Edited by Laura N, 09 March 2012 - 19:54. If your good ol' English drinkable comes in at £1.90 per bottle (at the local Co-op supermarket) then you're going to have to cough out 6 bottles in order to buy our new German laxative. Just for reference, here's my scan of Scabiosa. Thanks, that's great! Well, I can see similarities, but they definitely differ. Thanks, Mike. I'm thrilled to finally get a look at this ink. Now can you get your hands on the other new one? So glad it's wet and shades. Those are two great characteristics. I rather like the look of this one from all pens shown - quite subtle, with attractive shading. Pleasantly soft & smooth. A bit more Blue would have been welcome though. Performance seems quite all right. Thanks for the review! I've been thinking about getting Edelstein Tanzanite and Turmaline, and your review definately helped me. Wet and lubricating, great! Now ... this would be ink number .... 46? 47? I have just asked Pelikan what they mean by EXTRA SOFT INK on the box but they didn't know off hand. They said they'll let me know and I'll forward same. Interestingly, their site says "The Edelstein Ink Collection comprises nine brilliant colors with a special ingredient that ensures extra smooth writing and care for the fountain pen." So, I'd say that "soft" means an improved flow and/or wetness. Likely different detergents/tensides/lubes etc and/or higher concentrations thereof. This would be in contrast to the older 4001s, which most of us feel to be too "dry". Maybe something for even better maintenance. Unlikely any big pH modification. The first thing I had thought of was "softness" in the sense of pastell, creamy, chalkiness.... But as you can read above, they do say "brilliant", too, an adjective also used for the black, red and green 4001s. IMO, none of those are particularly brilliant, especially any of the new series. is it blue-black or purple-black? looks like an interesting color and different from MB Midnight Blue. This Tanzanite is a hint lighter and 2 hints more purple but definitely much wetter and smoother than MB Midnight Blue. MB's is however much more water-resistant. I just received a mail from Pelikan and they replied as follows (in this order): The Edelstein Ink now contains an additive which takes care of the inside of a piston filler pen and also enables a soft, gentle feeling when writing. That's good to hear (for me) since I had originally thought only of the improved wetness, which I like very much. I have used the 4001s so very little so that I've never really had any maintenance problems with those, just flow problems. Do you know if that applies to all the Edelsteins going forward, or is it just for the new colours? Sorry, I don't get it (honestly). This new term "SOFT" applies to all 9 of the presently available Edelsteins. And will continue to apply to all/any other Edelsteins yet to be issued. All 9 of these colours -- and of course the inks themselves -- are new. None of them is a rename like the policy adopted by Waterman (and possibly MB). Sorry, I read into your comment that the improved wetness was in the Tanzanite compared to most of the rest of the Edelstein lineup. 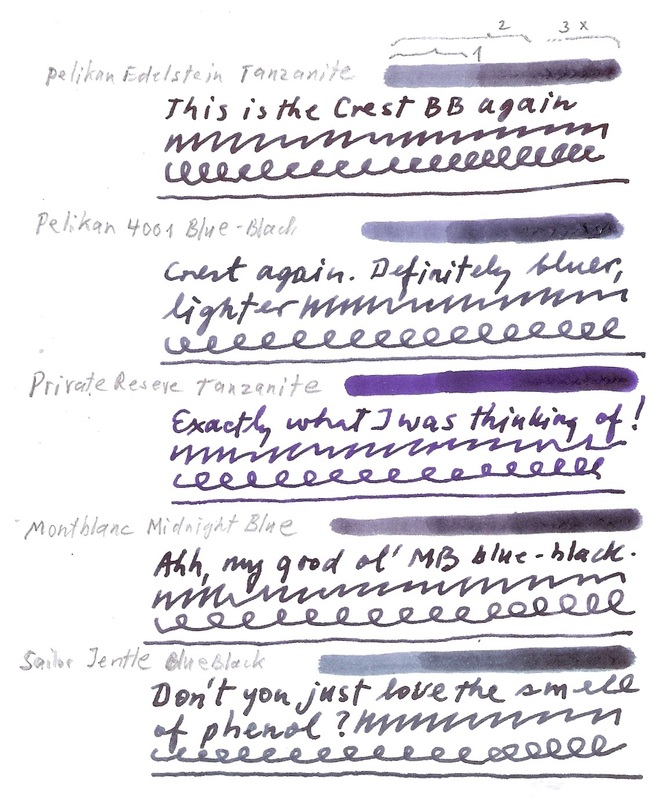 People tend to say the Edelsteins run a little dry, and that Tanzanite is among the wettest of the line, so I was thinking you mean that Pelikan added some materials to make this one wetter than previous Edelstein inks, and was asking if the rest of the inks would follow suit.